Researchers from Siemens have broken their own record for wirelessly transferring data over white LED light, achieving rates of 500 megabits per second. Image credit: Siemens. 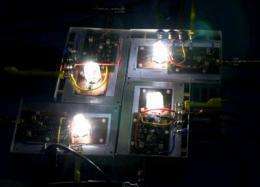 (PhysOrg.com) -- Researchers from Siemens have broken their own record for wirelessly transmitting data over white LED light. They’ve now achieved rates of 500 megabits per second (Mbps), shattering the previous record of 200 Mbps. Wireless data transfer using light, also called Visible Light Communication (VLC), could have applications in transportation, industry, and home use. Using an Ostar LED, one of the brightest LEDs on the market, the Siemens researchers in Munich collaborated with researchers from the Heinrich Hertz Institute in Berlin to achieve the new record. In the wireless technique, data are directly transferred by modulating, via the power supply, the amount of light emitted by the LED. The changes in brightness due to modulation are imperceptible to the human eye. On the receiving end, a photodetector converts the light signals into electrical pulses. The researchers could successfully transmit data over a distance of up to five meters at 500 Mbps; or, by combining five LEDs, they could transfer data over longer distances at rates of about 100 Mbps. Visible Light Communication could have a variety of applications. For example, in some factory and medical environments, VLC would have the benefit of not interfering with radio-frequency devices. On roads, LED stoplights or railroad signals could be used to transmit information to cars or trains. In the home, VLC could be used to transmit data via ceiling lights to a receiver mounted on a desk located anywhere in the room. Siemens notes that the technology could also provide an addition to WLAN technology with certain advantages. On coming traffic could communicate with each other. Maybe auto-dim those high beams? Why use white LEDs? White LEDs have a phosphor involved, which means they can't possibly be reacting as fast as a monochrome LED or semiconductor laser. Truthfully, I'm not seeing the news here. you could be transfering a file, then accidently wave ur hand infront of the detector, casuing a shadow, and ur connection is interrupted and u need to start the transfer again. Is this not important for supercomputing technology to? It doesn't really present much of a problem that someone may "break" the beam and lose the signal. This has many uses for quick file transfers. You could transfer a video file from PC to your phone in 5-10 seconds. It is unlikely you couldn't maintain communication for that duration and having to start over would be trivial. "A further advantage is that this form of data transfer is impervious to interception. Only the photodetector that is positioned directly within the light cone is able receive the data. In other words, it is impossible to "tap" the data transported in the light beam." Bzzzt!! ...entirely wrong. Unlike Laser diodes, LED light is not terribly directional, and the light 'cone' expands radially with distance from the source. So any suitably sensitive photodetector can "tap the data" [sic] by simply placing it anywhere near the intended target, and any suitably configured Receiver can decode the information. Note, too, that author(s) claim this could be used to transmit traffic control information at an intersection. I expect it could, but that, too, is hardly very directional. Perhaps the article's author(s) need a brief review of logical reasoning.